St. Adelaide was born in Switzerland, and was the daughter of Rudolf II of Burgundy. Her first marriage was at the age of fifteen, and it was to the son of her father’s rival in Italy, the King. Her marriage was part of a political settlement designed to be one of peace between their two fathers. They did have a daughter from this marriage, Emma of Italy. According to the Calendar of Saints, her first husband was poisoned by his successor, Berengar of Ivrea. He attempted to cement his political power by forcing her to marry his son Adalbert. When she refused and fled, she was tracked down and imprisoned for four months. A Priest named Martin, who dug a passage for her to escape, rescued her. She hid out in the woods and remained concealed until the Duke of Canossa, who had been told of her rescue, carried her off to his castle, where Berengar besieged her. She threw herself at the mercy of Otto the Great, and he and his army saved her, and they were married in 951. He was then crowned emperor of Rome and she was crowned the empress. They had many children, and four of them lived to maturity. 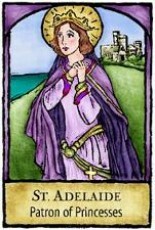 St. Adelaide had close relations with Cluny, then the center of the movement for ecclesiastical reform. She retired to a Convent she founded in 991 at Selz in Alsace, France. Although she never became a Nun, she spent the rest of her days there in prayer. On her way to Burgundy to support her nephew Rudolf III against a rebellion, she died at Selz Abbey on December 16, 999. She had just missed the new millennium by days, and thought that would bring the Second Coming of Christ. She had devoted herself to the service of the Church and peace, and to the empire, as guardian of both. She also embodied herself as a principal agent of the work of the Catholic Church, during the Early Middle Ages in the construction of the religious culture of Western Europe. Parts of her relics are preserved in a Shrine in Hanover, and her fest day is December 16th. St. Adelaide was the empress of Rome, and lost her husband at an early age. She went on to marry Otto the Great, and had many children, many who went on to serve in the political arena. She founded a Convent, Selz Abbey in Alsace, and retired there in prayer. She never became a nun, but was dedicated in her political role to support the Church and peace. She was a major agent for the Catholic Church in the Early Middle Ages, and for the construction of the religious culture of Western Europe.